Most travelers, whether adventurers or arm-chair tourists, are very familiar with Stone Henge, an ancient site in Wiltshire, England, best known for its unique megalithic circle of stones. The term “henge” actually refers to the ditch and bank of earth that surrounds the stone circles, which date back to 2500 BC. Stone Henge is a popular site for locals and tourists both. Its history remains largely unknown, leading to numerous theories about its construction and use. These range from tales relating to King Arthur to an argument between a devil and a friar, and many more. It is also a pilgrimage site for modern day druids and others interested in New Age beliefs. What many don’t realize is that Stone Henge is only one of a number of similar sites throughout the UK and Europe, where earthworks such as henges combine with stone circles or formations. Avebury is probably the second most famous henge site in the world, Like Stone Henge, Avebury is a Scheduled Ancient Monument and World Heritage Site. The are very close (about 20 miles or 32 km), as well, so if you visit Stone Henge, you can typically visit Avebury on the same day. Avebury is approximately halfway between the towns of Marlborough and Calne. The largest Avebury stone circle, the great outer circle, is older than the one at Stone Henge, dating back about 5000 years. It originally had 98 standing stones, making Avebury one of the largest stone circles in all of Europe. Other features in addition to the henge include long barrows, a causewayed enclosure, a stone avenue, and 3 stone circles. The Ring of Brodgar is a stone circle in Scotland on the Mainland in Orkney, Scotland. It stands on a small strip of land between two lakes, Loch of Stenness and and Loch of Harray. The ring of stones originally had 60 large stones, but only 27 remain standing. Legend maintains that Scandinavian inhabitants in Scotland called The Ring of Brodgar, “Temple of the Sun”, and several of the stones are marked with runic engravings left by the Nordic people. 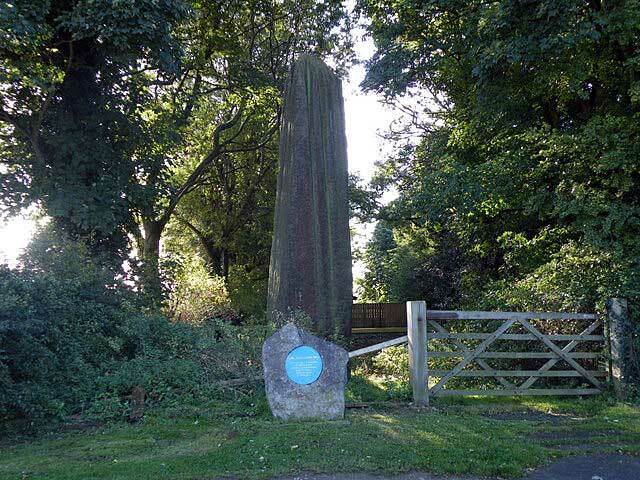 Near the River Ure at Boroughbridge in North Yorkshire, England are three naturally shaped stones known as The Devil’s Arrows. The unique grooves at the top of each stone were carved by years of rainfall. The tallest stone stands 22 feet 6 inches high, taller than any of the stones at the more famous Stonehenge. Legend tells that the stones were tossed by the devil at the nearby town of Aldborough, but fell short and landed at their present location instead. It is believed that the site was originally home to five stones instead of the current three. Another legend claims that walking 12 times around the stones anti-clockwise will raise the Devil. “The north section of the Rollright Stones – geograph.org.uk – 1411935” by Steve Daniels – From geograph.org.uk. The Rollright Stones are located on the border of Oxfordshire and Warwickshire in England. The site consists of the Kings Men stone circle, the King Stone, and the Whispering Knights. 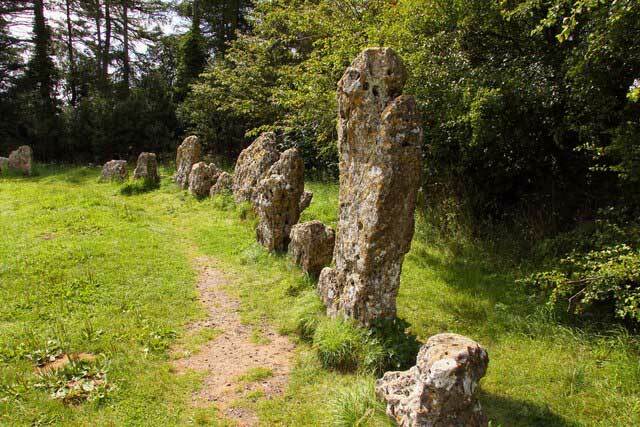 The Kings Men is a stone circle of 77 stones, made of oolitic limestone, that are heavily weathered, giving them a unique appearance. The King Stone is a separate stone, across the road (and in a different county) from the Kings Men circle. Its unique shape isn’t due to weather so much as a practice in the 1800s where people chipped off parts of the stone as a charm to ward away the devil. The final structure, known as the Whispering Knights, is an arrangement of five upright stones about 400 yards from the Kings Men circle.